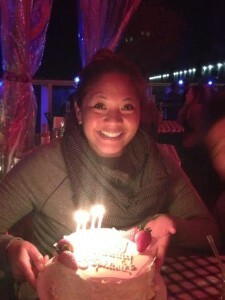 GOF Dish and Discuss: Birthday Bonanza! It’s so crazy to think that GOF is already 4 years old! 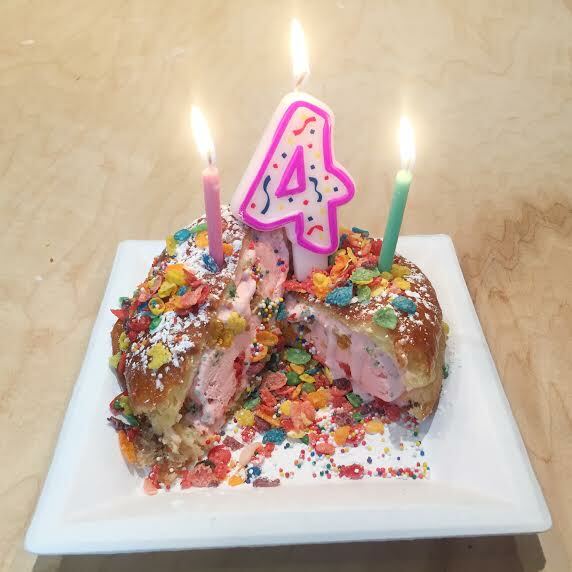 Summer and I celebrated our 4th birthday at The Parlor Ice Cream Puffs in my hometown of Roseville, CA. After being a longtime follower of their Instagram page, I was beyond excited to try one of their infamous doughnut stuffed ice cream puffs! Since it was our birthday, I felt it was only appropriate to order the Cake Batter Ice Cream Puff with festive Fruity Pebbles and sprinkles. Talk about a birthday wish come true! It was amazing, I would’ve never thought to use a donut to stuff with ice cream. The chunks of cake in the ice cream also add to it’s awesomeness. Summer took a break from her healthier habits to celebrate with a scoop of the Midnight in Paris, creamy coffee with Nutella swirls. All in all, I dub The Parlor Ice Cream Puffs the official birthday treat of the Girls on Food! When my kids were little, before they would even open their little eyes, I would wake them up singing “Happy Birthday” and hand them a wrapped present. They would rub the little sleepy’s out of their eyes and instantly be wide awake ripping into the wrapping paper. Then they would get a candle in whatever they were having for breakfast. Yes, I once managed to put a candle in a bowl a cheerios, light it and not have waxed Cheerios. My birthday’s growing up was much different. 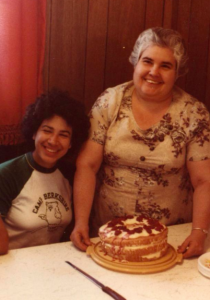 My dad, who I learned to bake from, would ask the same question a few days before our birthday “What kind of cake do you want?” My answer was always the same, Abuela’s cake. It was a cake that was his mother’s favorite and I just LOVED it. My dad would make the whole thing from scratch and when you cut into you had to eat the whole thing! It was an Angel food cake, sliced in three layers. Each layer had vanilla pastry cream and fruit compote. It was simple and the most delicious cake anyone has ever had, EVER. Did I mention he made every single part of this cake from scratch? Over the years I’ve made this cake and it never tasted like my dad’s, but it is quite the showstopper! When you cut into this light heavenly cake the pastry cream oozes out the sides and everything slides everywhere. It always sat on the Tupperware Cake holder and when we saw that sitting in the fridge, we KNEW it was going to be a good day and Happy Birthday! That’s my Abuela and a cousin getting ready to dig into Abuela’s Birthday Cake! I happened upon this birthday treat in an accidental fashion. I was at my friend’s house when I was about 10 or so and her family got the wrong cake for her birthday. 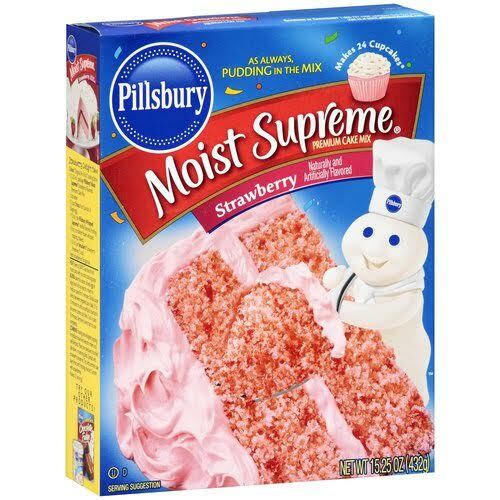 Apparently, she wanted yellow cake with cream cheese frosting but whoever was in charge bought strawberry cake with cream cheese icing. In the end, she got the “right” cake, but I had already tasted and was in love with the “wrong” cake. Which might later explain my choice in men, but that’s a post for another day… A simple strawberry box cake from Pilsbury with cream cheese icing is my all-time favorite birthday cake. When I had parties as a child, I always asked for that combination to celebrate a new year. I’m part of the most narcissistic generation, so I guess I better live up to it. But, as I graduated from the days where I was in school on my birthday to career, work-day birthdays I made a decision right away. I refuse to work on my birthday! It really should be a HR policy everywhere, in my opinion. Let’s just call it a birthday present to myself. I don’t necessarily have to do anything fancy – sleep in a little, stop by my fave coffee shop, grab one of my fave lunches, and do whatever, it really doesn’t matter. All that matters is that it’s my day to relax, take a mid week day off, and enjoy a leisurely day. It’s nothing glamorous, but it’s one of my fave birthday traditions!